Last time we talked about breeching, the rite of passage in which little boys in the nineteenth century changed from wearing dresses or smocks to wearing shorts and long pants. 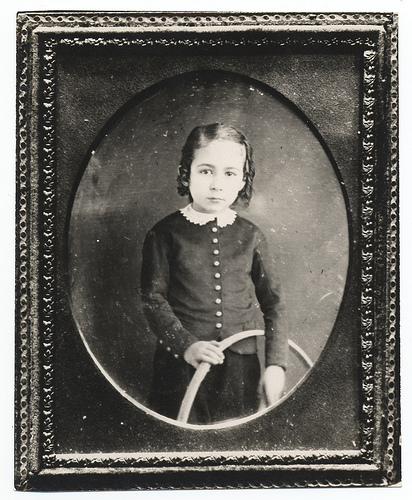 In this photograph, it is difficult to tell if this child is a boy or a girl. There is lace on a military type jacket and the child has long curled hair. This is a portrait of the artist Thomas Eakins in 1850. Boys wore their hair long and curled just like girls in the Victorian age. The hair was usually cut short much earlier than breeching occurred, usually around age 2 or 3. There was no rigid timeframe. The mother made the decision when to make the transition. Sometimes, the mothers kept their son's hair long even after breeching occurred at age seven or so. As the boys grew and matured, hair, for the most part, stayed short. Pictures of men from this era showed short hair slicked back with oil. Facial hair might take the form of a mustache, goatee, full beard or any combination of the above. They may also have been clean shaven. Long flowing hair was not the norm for men back then, even though romantic heroes from this era are characterized that way today.